A good few years ago I missed out when Jack Krijnen made the original burr set. It was called the Level 5 Burr set (more info here) and has 162 possible assemblies to keep a puzzler out of mischief! I managed to get this gorgeous version made by a fantastic craftsman called Mr K Y Wu. Rox met him when she visited the group in Taiwan. 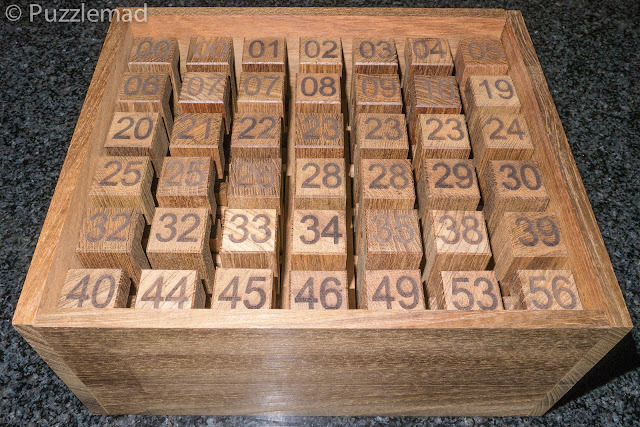 The pieces and box are beautifully made from Teak and fabulously inscribed with the piece numbers. This set is absolutely enormous and Mrs S has not been impressed that I have had to put it in the dining room with my other large puzzles. I cannot wait to play but I really do have quite a backlog just now!